Foundation the first game by the Canadian studio Polymorph Games, founded in 2016 by Philippe Dion and Leo Carnaut-Delord, two of the main creators behind the 2014 platform game Chariot. The production is a city builder game set in the Middle Ages. Foundation features elements known from other such productions, such as Anno, SimCity and Crusader Kings II. The gameplay is based on several aspects. The most important are the resources, which affect the development of your city. For example, building the city near a forest means that you can harvest plenty of wood, which makes it easier to construct wooden buildings. It may mean, however, that you'll have a limited supply of a more sturdy material, such as stone. Like the Anno series, Foundation allows you create complex supply chains, positively affecting your city's development. At first, all you have is a few settlers, who can be used to build the foundations of your future city. As you develop the agriculture and industry sectors, other inhabitants arrive, and you need to provide them with shelter, food, and jobs. Of course, you need to mind your resources and money, which are necessary to introduce any changes. Your last objective is to turn your little village into a powerful, prosperous, and well-guarded medieval metropolis. Foundation features full mod support. Thanks to the provided tools, you can create new units, buildings, areas, and even extra missions, which you can play yourself or share with other players. 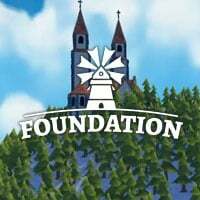 Foundation utilizes the studio's own engine Hurricane, developed for city builder games. The game's soundtrack was made by composers that used to work on the music of such productions as Crusader Kings II and Europa Universalis IV. Expectations: 8.4 / 10 calculated out of 51 players' votes.